Should we allow those fringe anti-systemic parties to undermine our democratic regimes from within, or should we ban them? 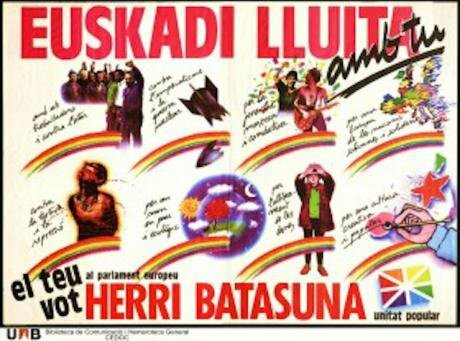 1987 poster of the political wing of ETA, Batasuna.Extreme, populist and anti-systemic parties are on the rise! Only this year elections in the Netherlands and Bulgaria and Germany returned excellent results for radical right parties (e.g. Party of Freedom, Alternative for Germany or Ataka). Even in usually quiet Liechtenstein The Independents (DU), a right-wing populist party, managed to obtain more than 18 percent of the votes. In France, Marine Le Pen came second in the presidential elections. Last Sunday the Freedom Party of Austria got more than 20 percent of the vote, and in countries like Greece or Slovakia support for neo-Nazi parties (i.e. Golden Dawn or People’s Party Our Slovakia) reach a notable 7 percent of the electorate. We learn from the “Who Governs Europe” project, that the average percentage of votes for anti-establishment (both right and left) parties in 20 western European consolidated democracies stands currently at 24.2, when less than fifty years ago it was 13.2 percent. Indeed, the success of populist/anti-systemic parties so far this decade almost doubles the average percentage of votes obtained at the height of the inter-war period (14.3 in the 1930s). Even if we were to disregard this trend in the levels of electoral support for those parties, the pattern is clear: almost 50 percent of the elections in western Europe with a record high polarization since 1900 have taken place in the last 15 years, the other 50 percent spreads across the 10 preceding decades. Given these general trends/patterns, and notwithstanding important nuances, scholars and practitioners alike seem to agree on the “threat” these types of parties pose for liberal democracy. How then do we deal with those fringe anti-systemic parties? Should we allow them to undermine our democratic regimes from within, or should we ban them? What are the consequences for the development of party politics? This is the question we addressed in our last article in the European Journal of Political Research. There we looked at the effects of banning parties, but also the consequences of the failure to ban, in various political systems both at the national (Germany and Turkey) and the regional level (the Saarland, Lower Saxony and Saxony in Germany as well as the Basque Country and Navarre in Spain). This is what we found. First of all, we can say that the banning of a political party will increase electoral instability as its previous supporters will have to choose between either abstaining in the next elections or finding a new party representing their particular interests. In other words, party bans ‘force’ voters to choose a marriage of convenience with another party close to their ideological preferences, if they do not want to either waste their vote or be left out of the political process. Secondly, the judicial dissolution of a salient party is to a party system like the removal of an organ in the body or the slaughter of a species in an ecosystem: the system may continue working, but its constituent characteristics/ mechanisms are altered forever. This is because as Giovanni Sartori clearly explained some 40 years ago, the number of parties determines the mechanisms of a party system and, any alteration to the format of the party system will have consequences on the way party politics evolve. Thirdly, the prohibition of a party also has important consequences for the process of a government formation, as the disappearance of a party with ‘coalition potential’ affects the way political parties interact/compete, not only because it destroys previous practices among the political parties in the system, either in terms of collaboration (e.g. Turkey) or discrimination (e.g. Spain), but also because it artificially alters the distribution of political parties, forcing parties to search for new political partners, new dimensions of competition, or both. These three effects taken together, however, show that while party bans do alter the party system, in the longrun the removal of the “anti-systemic” element helps to stabilize the party system, despite costs in terms of political representation and democratic legitimization. The latter was visible in the Basque Country, where the prohibition of ETA’s “political arm” (i.e. Batasuna) was followed by an increase in the percentage of spoiled ballots by more than 8 points. It is not only banning parties that might have negative consequences. The legalization of previously banned parties (e.g. Batasuna in the Basque Country) or the “failure to ban” a party (e.g. NPD in Saxony) might also increase electoral uncertainty, change the format of a party system (e.g. from hegemonic to competitive) or oblige parties to alter their patterns of government formation by forcing them to forge unnatural (conservatives and socialists in Navarre) or “great” coalitions (e.g. socialists and Christian-democrats in Saxony). All the abovementioned effects take place only if the banned party is relevant within the party system. Needless to say, it is different if the judicially dissolved party gets less than 1 percent of the votes or if it is one of the top-3 parties in the system. Thus, while the banning of the National Democratic Party (NDP) in Austria in 1988 did not significantly alter the country’s over-institutionalized party system, the prohibition of the German Communist Party (KPD) certainly did. All in all, decisions about the proscription of relevant parties may have fundamental implications for electoral stability, systemic fragmentation and government formation. Such questions remain important as to whether it is more appropriate to ban a party or deal with anti-democratic attitudes through political debate or civic education; or whether to deal with offensive or violent behavior through the criminal justice system. However, public debate should additionally address the question of whether banning a party might affect the stability of political choice and its implications for government closure. The next time someone intends to launch a party ban case in the courts, it might also be appropriate to consider whether the artificial constraints of a cordon sanitaire and consequent ‘uncomfortable’ or ‘undesirable’ government formations is a better outcome for democratic politics than a party ban.